Among many things, one area where The Phantom Menace falls behind the other Star Wars films is its lack of a clear hero's journey, driving the narrative as Luke's drives Star Wars and Rey's drives The Force Awakens. Fans like myself have debated Episode I's weird plot -- and its issues -- for years, and one question that comes up persistently is endemic to the problem: who, exactly, is the movie's main character? Anakin Skywalker, who might be presumed to be the obvious choice, since the Star Wars prequel trilogy was marketed as being his story. It's a choice complicated by Anakin's fall to the Dark Side, which -- in writing terms, if not in several others -- would require some gymnastic reworking of the traditional hero's journey. Anakin's tale is not classical Romance; it is classical horror. Obi-Wan Kenobi, who my generation grew up expecting to be the lead character of Episodes I-III. This would have been a good choice: there is quite a bit of dramatic room in the idea of a brash Jedi learning the error of hubris by going rogue and training the man who would grow up to be Darth Vader. This, of course, is about as much of an outline of Obi-Wan's journey as the original Star Wars trilogy provided. The prequel trilogy does not expand upon it much at all, and leaves out several of Obi-wan's key beats, most of them around how Anakin's fall impacted him. Qui-Gon Jinn, the dark horse favourite, a character new to the mythology who appears in Episode I to do many of the things we might have expected would fall to Obi-Wan: finding Anakin, defying the Jedi Council, and committing to train the Chosen One as his own, regardless of how Yoda feels about it. Qui-Gon dies for this. This, too, might have been an interesting story. Finally, there's Queen Padmé Amidala, the 14-year-old ruler of the planet Naboo, who is -- inescapably -- the actual protagonist of The Phantom Menace. I say inescapably, except that it is in fact entirely escapable, in that the movie does not focus on her, or her story, at all. Padmé is a structural protagonist whose story forgets to be about her. She is the character in the story who is most specifically given a plight, a crisis to solve, and the tools with which to solve it (including, in grand Star Wars tradition, trusting her own instincts above the advice of others). In Joseph Campbell's hero's journey model, all of the basic steps are present in her story, with the exception of the refusal/answer of the call. The Phantom Menace, indeed, is structured very much like the original Star Wars, if you take Padmé as the principal character. Two secondary characters -- Qui-Gon and Obi-Wan here, C-3PO and R2-D2 in the original -- meet us at the start of the story and carry us, and the narrative, into the crisis, by way of the blockade of Naboo / capture of the Rebel blockade runner. 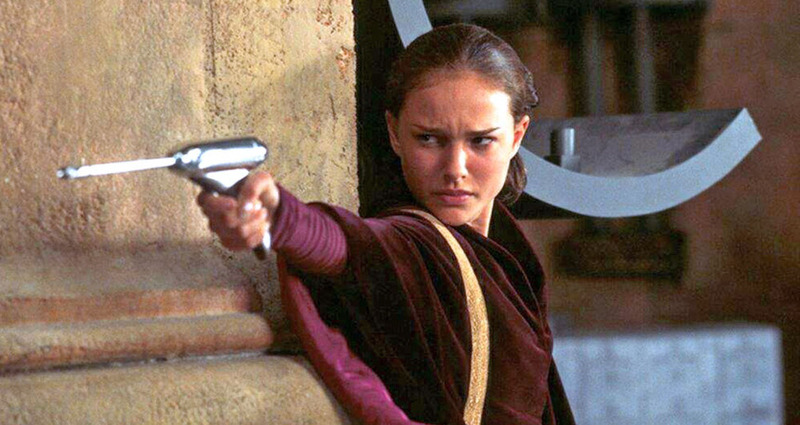 Padmé learns and matures and, after democratic process breaks down (another thematic concern of the prequels; arguably its most successful one), takes matters into her own hands, takes action, by forging an alliance with an unlikely ally and winning back control of her planet through blaster fire. Of course, you'd never know any of this by the movie George Lucas ended up making, whose focus is entirely on the other three leads (all of whom are, of course, male), leaving Padmé as a scarcely-functional plot mechanic. She is there to provide the crisis, which in a more traditional script, the male hero would be there to solve. It's odd and unusual, then, that Lucas' script doesn't end up going that route either: again, the third act of The Phantom Menace is built around Padmé having to solve her problem herself -- and yet she is still not focused on, by her own movie, while doing so. Awkward dramaturgy like this is often a hidden (dare I say, phantom) cause of audience dissatisfaction with stories and motion pictures, particularly in narrative modes like fantasy and adventure, where the archetypal structures are so well-worn and unconsciously familiar. With no one to truly root for in The Phantom Menace, we are at a level of distance from the dramatic stakes, even if those dramatic stakes are around trade disputes. Trade disputes, themselves, aren't the problem (The Last Jedi is driven by a fleet running out of gas in space, and it's outstanding). The lack of functional identification characters, which bring the audience into the story, is -- and always has been -- The Phantom Menace, and the entire prequel trilogy's, signature problem. As Caroline Siede recently pointed out, few characters were more poorly served by the prequel trilogy than Padmé. She develops into a moderately interesting character in Attack of the Clones, only to be sidelined in Revenge of the Sith by pregnancy and an inevitable death (of a broken heart, no less). Natalie Portman's delivery of the prequel trilogy's sole truly indelible line ("This is how democracy dies...") is cold comfort for fans of the actress, who were excited by her casting, and had to endure three long movies of Lucas failing to deliver her a single compelling dramatic arc. Ironically, the answer was in front of him all along, sandwiched between his earliest ambitions of a female Starkiller hero, and Disney Star Wars' revelation of Rey as the saga's new hero going forward. Padmé was lost in the middle, a hero's journey ignored in favour of those of lesser men.